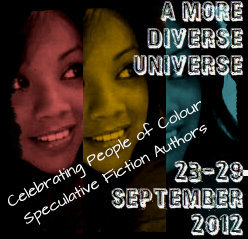 Welcome to the More Diverse Universe challenge! For this challenge, participants were asked to read a work of speculative fiction/fantasy/science fiction by an author of color. (Bonus diversity points if it also has a protagonist POC). Since the challenge was on a tight schedule, I opted for a short YA book. I would have preferred to read something longer – maybe another Gabriel Garcia Marquez, or even attempt a different Salman Rushdie after getting bored to tears by “Midnight’s Children” – but that would have taken me over a month, and I only had two weeks. I loaded up my library hold list with suggestions, but the first one to come through was “Tales from Outer Suburbia” by Australian writer/illustrator Shaun Tan. It’s hard to classify this book. Kevin saw it and immediately asked why I was reading a kid’s book, which was a fair question – it’s a tiny book with lots of illustrations. The language and subjects, though, are definitely aimed at middle-grade readers and higher. The stories are extremely short (sometimes irritatingly short – as in, some-of-them-didn’t-seem-to-have-a-point short), but the beautiful illustrations fill in any gaps. Let me backtrack a little. First of all, I made the mistake of doing a little research on Tan before I read the book. This taught me two things which set the bar way too high: everyone who’s read Shaun Tan adores his works, and Tan’s greatest influence is Ray Bradbury. So I dove in expecting that I would a) be bathed in the glory of unprecedentedly great writing, and b) have my mind blown by some Bradbury-esque metaphors and plot twists. So it was a bit of a reality check to read the first story – a whole one page – in which a wise water buffalo points people in the direction of their dreams, and…that’s it. And several other stories were like that: beautiful, but not fleshed out, with no real meaning or message. As I read on, though, I began to realize that that was okay. Sometimes art and writing are just beautiful for beauty’s sake, and these stories are indeed beautiful. My absolute favorite, though, and the story for which I would buy this book if only to have it at my fingertips at all times, was “Distant Rain,” a gorgeous collage/fairy tale about what happens to everyone’s secret, unread poems. Wouldn’t we love it our secret, unread works actually slipped out into the world to make it more beautiful? Wouldn’t it be wonderful if everyone’s creative courage was recognized somehow for its tiny contribution to humanity? Several of the stories in this book had that theme of creativity as a facet of humanity, and the courage it takes to be creative. In one story, everyone has a missile in their backyard, presumably so that every citizen can contribute to the country’s defense in the event of nuclear war. Instead of (pardon the pun) going ballistic and launching missiles everywhere, the citizen decorate their missiles, painting them and transforming them into everything from treehouses to pizza ovens. Having recently (finally) finished “East of Eden,” the idea of individual choice to do good or evil was still fresh in my mind, and that probably shaped my reading of this book, but for the better, I think. It takes courage to do the right thing, especially the right things illustrated in these stories – to not split up in anger when your marriage is in trouble; to show restraint in a warlike environment; to sacrifice time and money to build a happy, unified family; and to show kindness to strangers, even if you don’t understand them at all. I love this review! Tales of Outer Suburbia is such a fantastic read. I’m glad you enjoyed it. My favorite story in the collection is probably the one about the brothers walking as far as they can to reach the end of the world. Thank you! That was a really sweet story. 🙂 I’m a little bummed I have to give this back to the library!